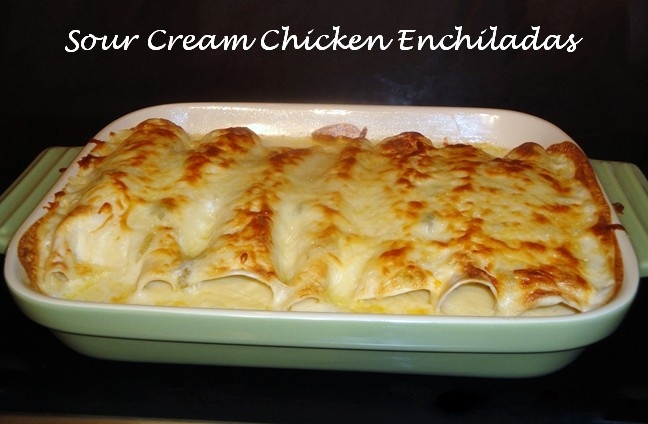 We’ll finish up this month with one of my personal favorites – Chicken Enchiladas with Sour Cream Sauce. I found the original recipe for this in a newspaper’s “Food” section many, many years ago, but this one is adapted from The Pioneer Woman’s most excellent recipe. 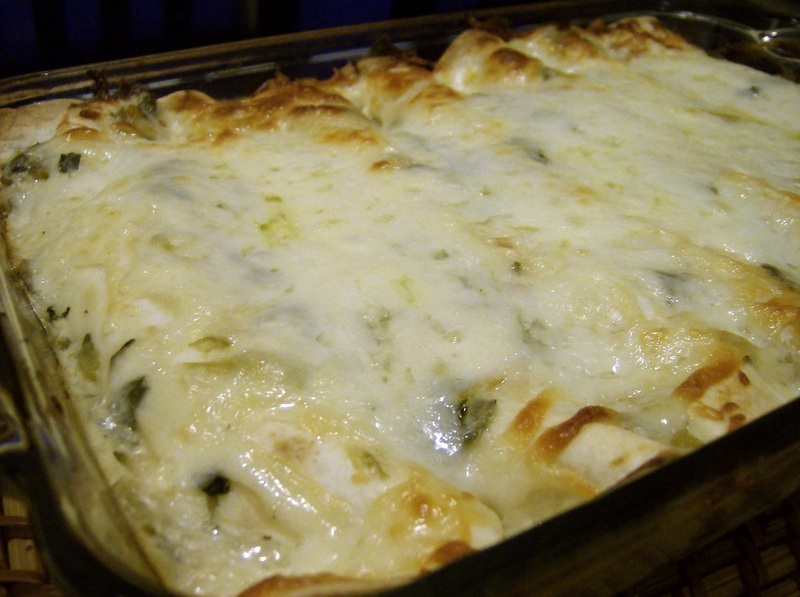 Most recipes for “white” chicken enchiladas that I have seen over the years include jalapeno peppers, chili peppers, and/or cilantro; since nobody in our family likes things that spicy, I adapted the recipe to suit our tastes. Feel free to add in any “heat” that your family might like! Heat 2 tablespoons oil in a small skillet over medium-high heat. Fry tortillas for no longer than 20 seconds, just to soften (do not allow to become crisp.) Place tortillas on plate to keep warm. Heat 1 tablespoon oil in separate skillet over medium heat. Add onion and saute until softened. Add chicken. Stir together. Add 1/2 cup chicken broth and stir. Add cream and stir, allowing mixture to bubble and get hot. Turn off heat and set aside. In a separate large skillet, melt butter and sprinkle in flour. Whisk together and cook over medium heat for one minute. Pour in 1 1/2 cups chicken broth. Whisk together and cook until mixture starts to thicken. Reduce heat, then stir in sour cream. Add 1 1/2 cups grated cheese and stir to melt. Remove from heat. Add salt and pepper as needed. Pour cheese mixture all over the top of the tortillas. Top with extra cheese. Bake at 350 degrees for 30 minutes. If desired, sprinkle with cilantro and/or paprika for extra color/flavor when serving. Garnish with diced tomatoes, salsa, avocados, and/or a dollop of sour cream on the side. This entry was posted in Foodie Friday, Just Because, Recipes, Texas and tagged Bland, Chicken Enchiladas, Pioneer Woman, Sour Cream, Texas. Bookmark the permalink.